Why is Laser Therapy at East Mountain Massage? Laser therapy has been scientifically proven** to speed up the healing process, which in cases of sudden onset injuries, i.e. (not limited to) Whiplash, sprained ankle, scar from a recent knee replacement surgery or chronic reoccurrences i.e. (not limited to) inflammation/pain from osteoarthritis, fibromyalgia, degenerative disc disease. If left to natural healing, the time it takes for these issues to resolve turn into longer, agonizing healing time frame, in addition compensating muscles and other issues such as increased pain, stiffness, swelling and putting more stress and strain on the body, increasing that healing time frame, which in this day and age, who has the time OR energy for this? 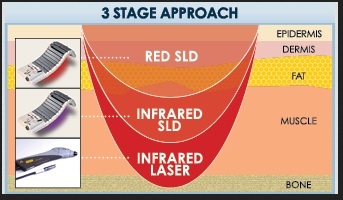 Laser therapy is the use of monochromatic light emission from a low intensity laser diode (250 milliwatts or less) or an array of high intensity super-luminous diodes (providing total optical power up to the 2000-milliwatt range) to irradiate diseased or traumatized tissue with photons. The process is curative and therefore results in the elimination of symptoms including pain. Conditions treated include musculoskeletal problems, the arthritides, sports injuries and dermatological conditions. The light source is placed in contact with the tissues allowing the photon energy to penetrate widely, where it interacts with various intracellular biomolecules resulting in the normalization of cellular components. This also enhances the body’s natural healing processes.